Houseplants include a wide variety of plants, often from tropical or subtropical regions. Identifying a houseplant is similar to identifying outdoor garden plants. According to the Oregon State University Department of Horticulture, "Leaves are often the basis for identifying plants since they are so easily observed." To identify a plant based on its leaves there are several characteristics you will want to note. The leaves of plants grow in one of three basic configurations. Opposite leaves grow directly opposite one another on the stem. Alternate leaves grow in a staggered, or alternating, fashion. A popular group of houseplants called philodendrons have alternating leaves that grow on vines. Whorled leaves grow around the stem as if on a ring. There are few plants with whorled leaves. Some species of fuchsia, which can be grown indoors, have whorled leaves in clusters of three to five. Houseplant leaves grow in a variety of shapes. The arrowhead plant is aptly named for its large leaves shaped like an arrowhead. Plants leaves are generally divided into broad and narrow leaves. Of course, there are many variations within those two categories. Jade plants, for example, have small, broad leaves. When noting the shape of a plant leaf also consider whether the tip of the leaf is rounded or pointed. The edges of leaves are called margins. Smooth-leaf margins are called entire leaves. Leaves with notches, or teeth, along the margin are called toothed. 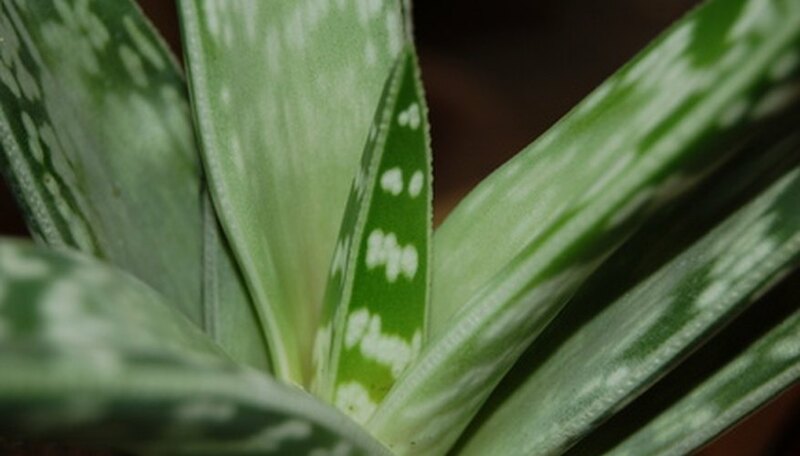 A majority of houseplants have entire, or smooth, margins. Indoor ferns, however, are an example of a houseplant with toothed margins. Aloe plants also have sharp, needle-like toothed margins. Most houseplants are tropical or subtropical in origin. This means many houseplants have thick, succulent-like leaves. Aloe and jade plants are both good examples of succulent-like leaves. Some leaves will have small hairs on them. Note whether the hairs are on the upper or underside of the leaf. Also observe whether the hairs are dense on the leaf, or sparse. Houseplants are often chosen more for their leaves than their blooms or flowers, which can be sparse. Houseplant leaves can be solid in color. Others can be variegated. Variegated leaves have multiple colors on a leaf, including green, white and bronze coloring.